So, we got Eldest One a Star Wars(tm) chess set for his double digit birthday. The Melbourne Connection got him soccer goalies gloves, the Grandparents got him books. So he was in seventh heaven yesterday, and we played a lot of chess and soccer. The sky was clouded out, so I couldn't show the rellies the comet last night. But I did hand my photos around. That at least covered part of my comet craving. With a full house of rellies, including sister-in-law in the office, my posting is going to drop a bit over the week, and there is a huge amount of stuff to post about, the Pluto probe at Jupiter, a massive solar explosion the science of the comet and more readers images. I'll try and get some things up when I can. Here are a selection of the readers images that I have been promising for a while. Remember, copyright remians with these folks, so if you want to publish them in a glossy magazine, you have to ask their permission first. Also, my sister lin law will be camped out in the office for the next few days, so posting frequency will drop. Anyway, the first of these beautiful images is from Geoff Sims again. This was taken in Sydney on Jan 22nd (sorry for taking so long to post this Geoff). I've got more from him to post later. As always, click on the image to enlarge it. Words fail me in describing this image. 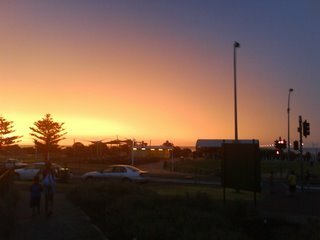 This image was taken by Andrea Deegan somewhere between 9 pm and 9.30 pm , on the 24 January, looking across Oyster Harbour, toward the town site of Albany. It was taken with a Panasonic Lumix DMC FZ30 , a 60 second exposure, on a tripod. You can see the striations in the tail, and the ripples in the water make a beautiful composition. This image was taken by Steven Bollipo from Launceston, Tasmania around 9:40 pm on Jan 25. I like the way the tail projects up into the clouds. This image is from Phill Williams of South Australia. The photos were taken at Mt Barker summit on Wednesday night (Jan 24) using a Canon 10D with a Sigma 28-200 lens. This image was a 30second exposure. Beautiful detail in the tail, with an interesting foreground. I have more images from these folks, and will post them later. Hello everyone who is coming here via the net adventures section by Samela Harris from the Adelaide Advertiser. Please browse around, the McNaught Chart is here. I'll be putting up more readers images tomorrow. Right now I'm preoccupied with EldestOnes 1010 birthday (you have to convert from binary). Australia Day was clouded out, so no comet (sigh, no comet fix today MUST PHOTGRAPH COMET (sfx: cold water being poured on head)). Ahh, I'm better now. Anyway, the Grandparents are in town for EldestOnes 10th birthday. Yes, EldestOne has reached double digits. He is very excited, so Grandparents made the 800 km journey to be with him. 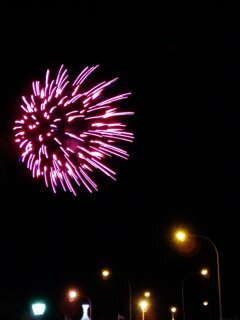 We clebrated their safe arival with dinner at a cafe in Semaphore, with a balcony view overlooking the pier and fireworks display. Despite the cloud it was a plesant evening, so everyone was out in force, with picnicers crammed into every available free space. We actually hadn't planned to stay for the fireworks, but with the cafe full of Australia Day revelers, by the time we got our food, the fireworks were on. We got a nice view for the cafe balcony. By the time we got home, the boys were ready for bed, ready to celebrate Eldest ones double digits today. 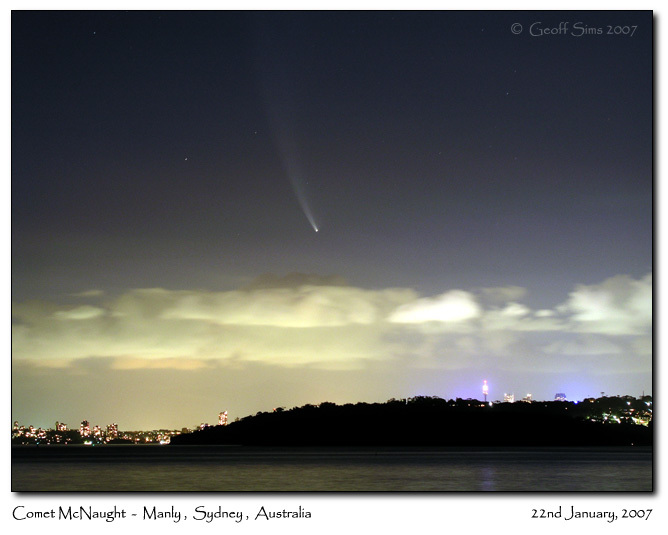 Comet McNaught at around 21:30 on Jan 23rd (click to enlarge). SLR camera, F 2.0, 400 ASA, 10 second exposure, Kodak film. 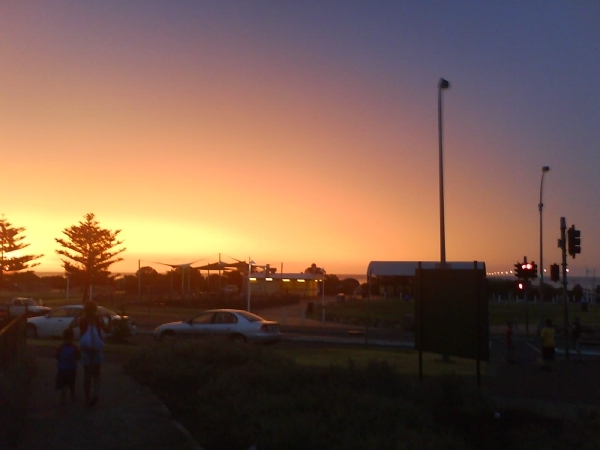 This is a shot taken during another mini astrofest down at Largs Bay. More readers shots to follow. Chart of the location of comet 2006 P1 McNaught over the coming week (click to enlarge). 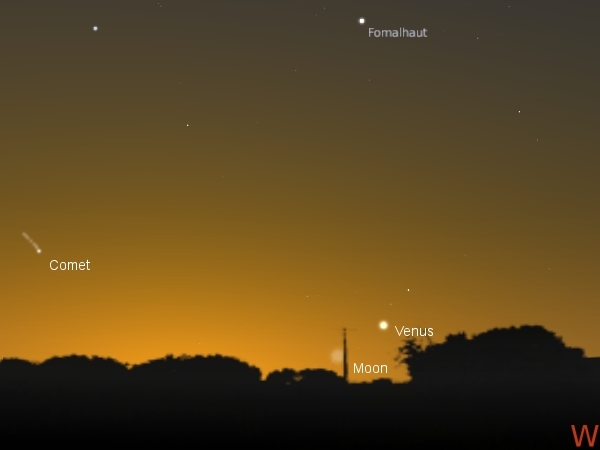 Chart is for 40 minutes after sunset, and the comet is visible until at least 10:00 pm local time. As the week progressess, the comet gets dimmer but higher, and moonlight will interfeer with seeing the tail, but the view will still be marvelous. smoke, traffic smog, summer haze and clouds." Below this is an image from Tony Travaglia of New Zealand. This was taken with a Canon 300D, 300mm lens, ISO 800 and 20 sec exposure on the 22nd (click to enlarge). Good definition of the comets head here. Comet McNaught taken over Larg's bay Pier, SA about 9.30 pm click the image to enlarge it, 10 sec exposure, ASA 400, F 2.0 Fugi film (compare with the shot taken around 9:20 pm using the digital with a nominal 6 secon exposure). The weird angle is due to the tripod mounting being skew. So I got over excited and developed my film straight away. The detail in the comet is amazing, the forward spike is easily seen, as are the Synchrones (those striations in the tail). I'm very happy. I've got some more shots tonight, I did a bit of playing around with exposures, and the sky was a bit clearer, it was easier to see the tail stretching uo past Grus the crane. But I'll wait a day or so to develop them, and get more shots tomorrow night hopefully. I also have a backlog of readers images to post. I'll try and do that tomorrow. In which I see comet McNaught yet again. Comet McNaught on the evening of Monday, January 22, around 9:20 pm ACDST, Olympus mju:300, 6 seconds exposure (click image to enlarge). The clouds finally parted yesterday, I could barely constrain myself with anticipation. The Sun set at 8:30 pm ACDST, so around 9:00 pm ACDST I hurried up to the beach clutching my digital and SLR cameras and two tripods. 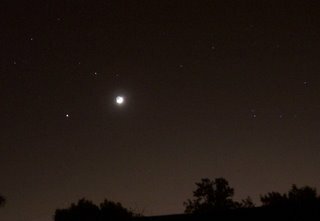 On the way I ran into neighbor's Son, who had set up his telescope in the front yard in anticipation, I checked out Venus in it then went to the end of the Street and set up my cameras. 9:05 pm. I've set up the cameras and taken Dark Frames, I can now see the comet as a bright dot in the blue sky, with only the faintest hint of tail. The first shots are taken. 9:15 pm. The Comet has about 5 degree of tail visible and the head is quite bright (magnitude 1 perhaps, hard to tell with no nearby reference stars), Next Door Neighbour has come up for a look with his nifty binoculars (I left mine behind in the rush). The comets head and tail are clearly visible in the binoculars. 9:30 pm The Comets tail is growing in visibility, and is at least 10 degrees long (about two handspans). The head is beginning to dim as it gets closer to the horizon. Neighbor's Son, Train Companion, Bike Maker have turned up to watch and take photos. I develop envy about their digital cameras, that take much better images than mine. Their images show a clear fan of brightness pointing away from the nucleus and main tail (this I can now see readily in binoculars). At this point the car headlights get terminally annoying (why are there so many cars about on Monday evening for Zarqon's sake) and are interfering with our night vision we pack up and head down to the beach. 9:45 pm The comets head is nearly invisible, but the great fan shaped tail reaches up to alpha Grus and beyond, well over 12 degrees. I can't see any striations, but my night vision isn't what it used to be, and the comet is directly above the lights of the pier. We have now been joined by families and Eclipse Guy. Digital images are compared. 10:00 pm. With the comets head well hidden in the murk of the horizon, and the tail still stretching up in the sky, we all head home. Eclipse Guy and I have a cuppa together (after passing Bettdeckererschnappender weisle a hot milo) and discuss the comet, view digital images and relive the wonder. 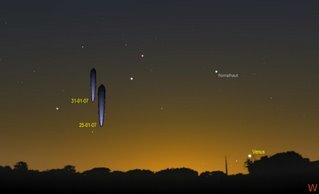 Location of comet P1 McNaught around 30 minutes after sunset (click to enlarge) above the western horizon as seen from the southern hemipshere. 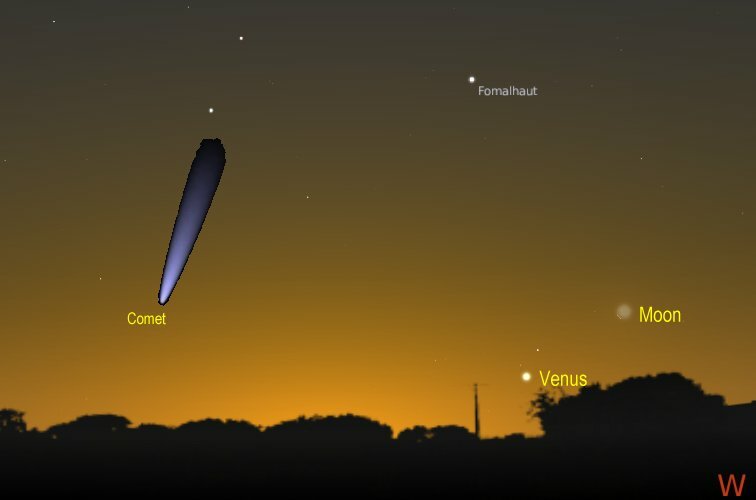 Around 30 minutes after sunset Venus, the crescent Moon and comet McNaught will put on a spectacular display. You way have to wait some minutes for most of the comets tail to come celar, but the comet and the lower part of the tail should be very easy to see. 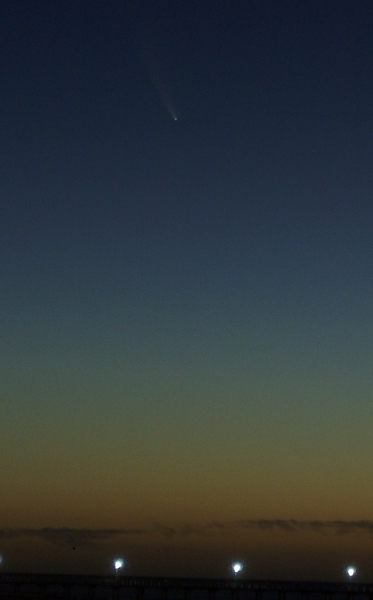 The comet is roughly on the same level above the horizon as the crescent Moon, and about 5 handsapns to the left of the Moon. The two bright stars of the constellation Grus almost point directly at it. 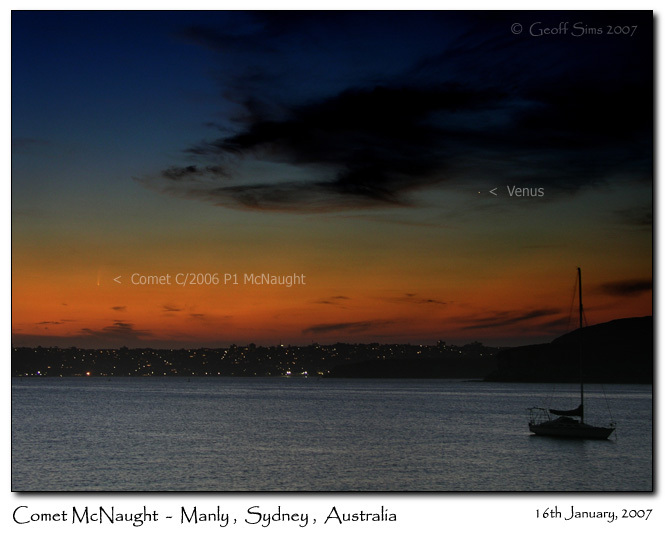 More spectacular images from Rob McNaught (note the comet images have moved from the comet info page) and Gordon Garrad. Some good telescopic images are here. Today started with cloud/rain cloud and continued for most of the day. However, when we came out from the movies (Night at the Museum, very funny) just on sunset, there was a big blue patch of sky. Of course by the time we got home, the sky was black again. The sky would tease me, with a band of blue near the horizon (while I was sheltering from the driving rain from the cloud directly above me), then complete cloud. Eventually I braved the howling gale to go down the beach. There was a band of could that steadfastly hugged the horizon, and lots of other clouds that shot past just above. And one that stayed put. As the sky darkened and my eyes adjusted, this band of "cloud" was a pillar of "cloud", not far from the stars of Grus, the crane. And it stayed steadfast despite the hurrying of other clouds. 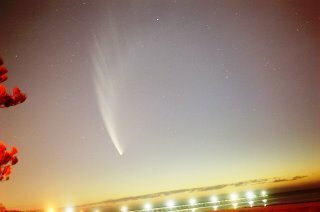 It was the comets tail! I was seeing the tail poke up above the clouds! It was amazing. I didn't try to take a photo, the wind was trying to push me away, and any camera would be whirled away to oblivion, so I just enjoyed it (as much as you can hunkering down under a small shrub trying to reduce the impact of the wind). 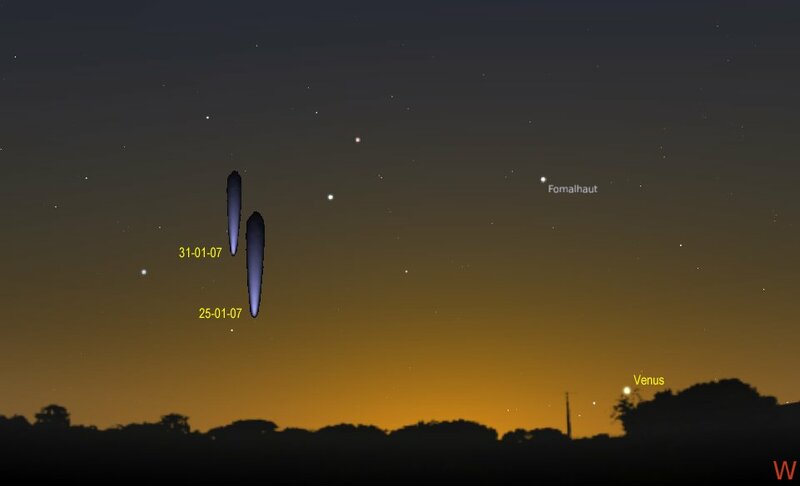 This gives me an oppotrunity to link to this series of great images from Vello Tabur, showing the tail develop as the twilight progresses in Gilgandra, NSW, and these images of the tail poking up above the horizon from Italy, 45 deg North, Hawaii, and the USA. 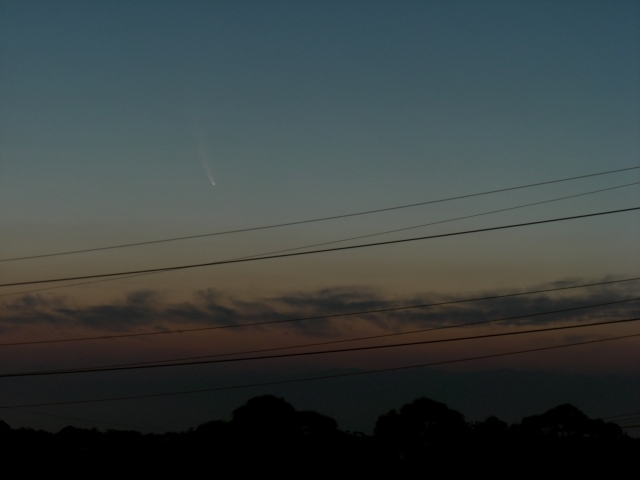 I promise I will blog about something other than Comet McNaught in the near future. This superb image of comet P1 McNaught comes from Darren Larcombe of Carnarvon Station Reserve. The photo was taken about 19.40 on 18 January, using a Cannon digital SLR, about 200mm lens and 2 second exposure. As I stare at the solid wall of cloud that has blocked the comet these past two days, and promises to block it out tonight, I can console myself with some truly fantastic images taken by others. 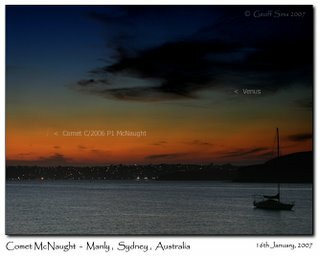 I've already posted the links to Rob McNaught's images, but they are worth posting again. Peter Adderly of Sydney has some terrific images of the extended tail. The tail is a bit over two handspans long in the sky at the moment (about half the distance between Venus and the comet itself), this is astounding. It is so long that people in the Northern Hemisphere can see the tail poking up above the horizon after sunset. 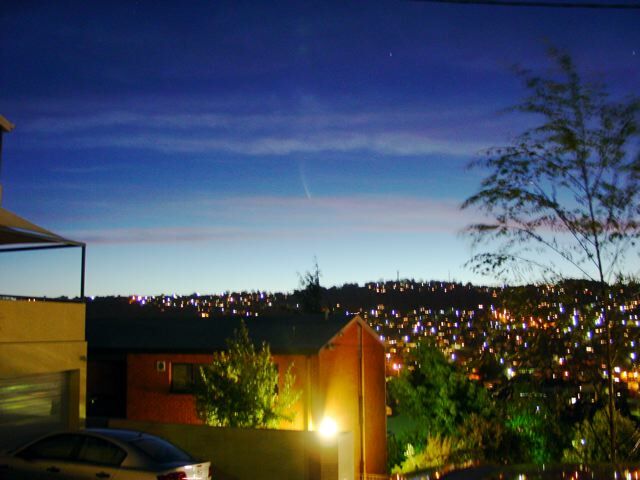 Here's another image of the comet from Chile showing the astounding extent of the tail. Another image from WA by Kirsten Harris from back on the 17th is nice too, and gives an idea how much the tail has evolved over the past two days. 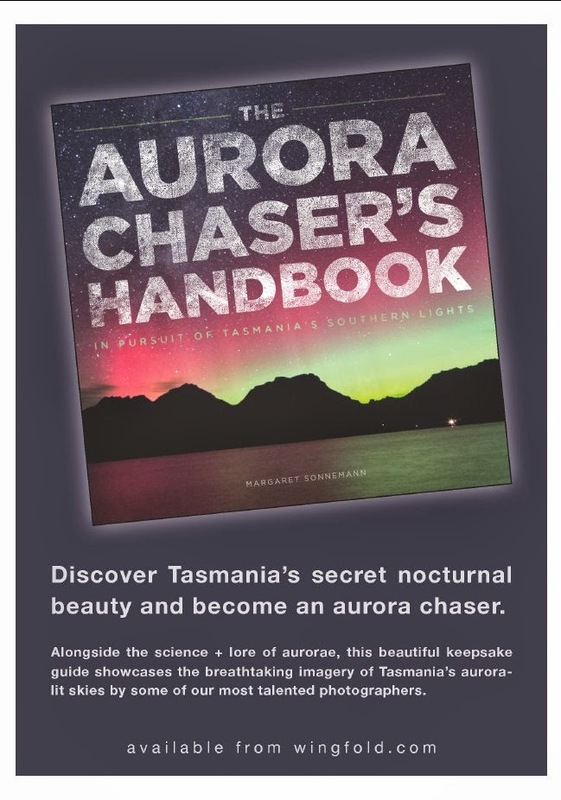 As allways, there are heaps of images from around the southern hemisphere at Spaceweather Gallery. Also don't forget the Ice in Space photogallery, with a huge range of Australian images. Weather forecast, well it looks like Central Australia and North QLD will be covered in cloud until late Sunday (sigh). At least the rain has helped a bit with the bushfires, but they are not in the clear yet. Again, you might consider donating to help those affected by the bushfires. Nonetheless, if you have ANY chance of even a small break in the clouds, go and have a look. This is the most spectacular comet for 30 years, and well worth it. Tonight and Sunday the crescent Moon will make the scene more beautiful still. A view of the western horizon on Saturday January 20th about half an hour after sunset (click to enlarge). 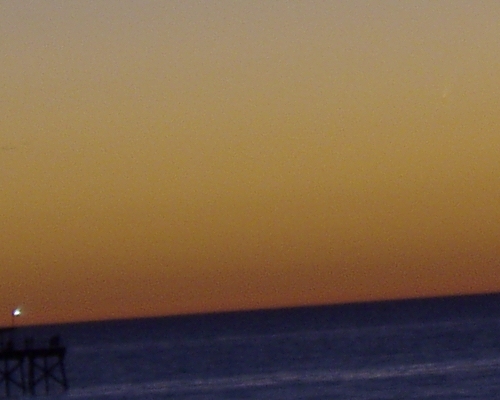 The very thin crescent Moon is just below Venus, off to the south-west is comet P1 McNaught. This will look fantastic. Comet McNaught is just getting just getting better and better. It's getting dimmer, but higher in the sky so it is easier to see, and an amazing tail. Sunday night the crescent Moon will be higher (as will the comet) and this should be just as beautiful. Raining cats and dogs here at the moment. I'll post some more images tomorrow. 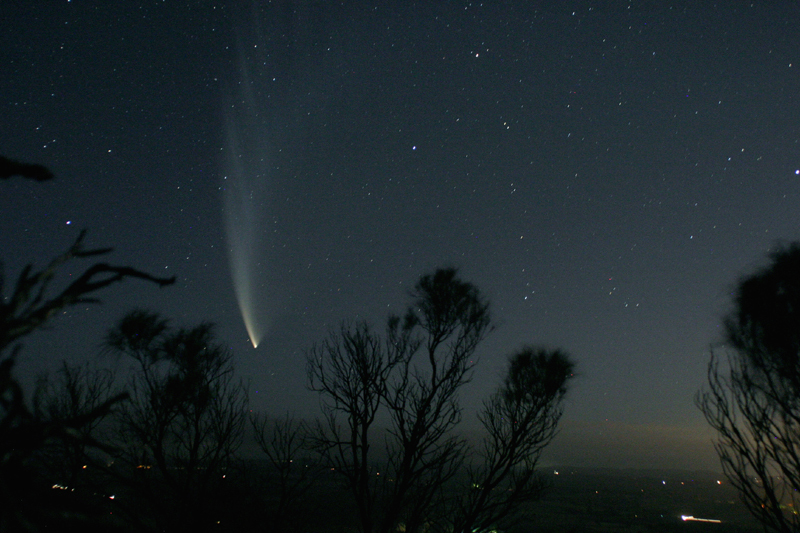 More Stunning Images of Comet 2006 P1 McNaught! Thursday night was completely clouded out here (the amazing red glow in the photo is sunlight reflected off the clouds), and coulds and smoke have covered lots of south-east Australia. 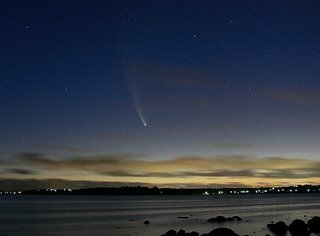 Still some amazing images are coming from Australia and New Zealand, and it looks like comet McNaught is just getting better. First off is this amazing image from Graham Palmer of New Zealand. My jaw hit the floor when I saw this. Note that as this is a 15 minute exposure, the comet won't look like this to the unaided eye, but it still will be big and bright with a long tail. Next up is Terry Lovejoy, with this great image from QLD. The Ice in Space Forums have lots of good southern Hemipshere images, as does the Spaceweather gallery. 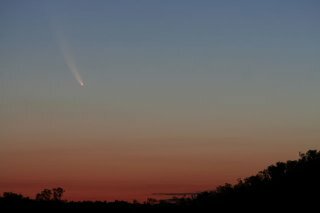 The bottom line is "Keep on Looking", comet McNaught isn't finished yet, and may well be a Great Comet. 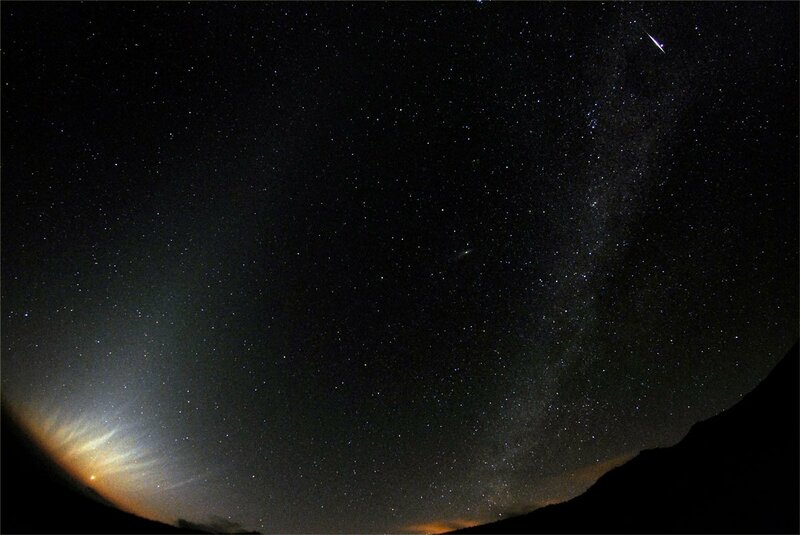 In the Northern Hemisphere, you can still see the tail of the comet just above the horizon, see here for a great shot. Wednesday afternoon didn't look to promising, clouds hugged the horizon for most of the afternoon. 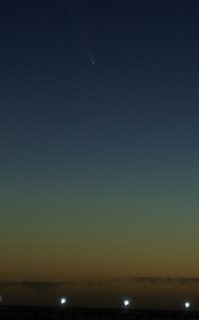 Around 20 minutes aftersunset I wandered out to have a look, and couldn't see anything but a band of cloud below Venus. Then I moved a step to the right of my viewing area and the comet popped out from behind a house roof. It had changed position much more than I expected. It was beautiful, it hung very clear and bright in the evening sky, in a crystal band of blue above the cloud. I estimate it was probably as bright as Sirius, definitly less bright than Venus, but still very bright. I ran inside and got the kids, and we all marvelled at it for a while until the lure of "The Lion, the Witch and Wardrobe" got too much for the kids. 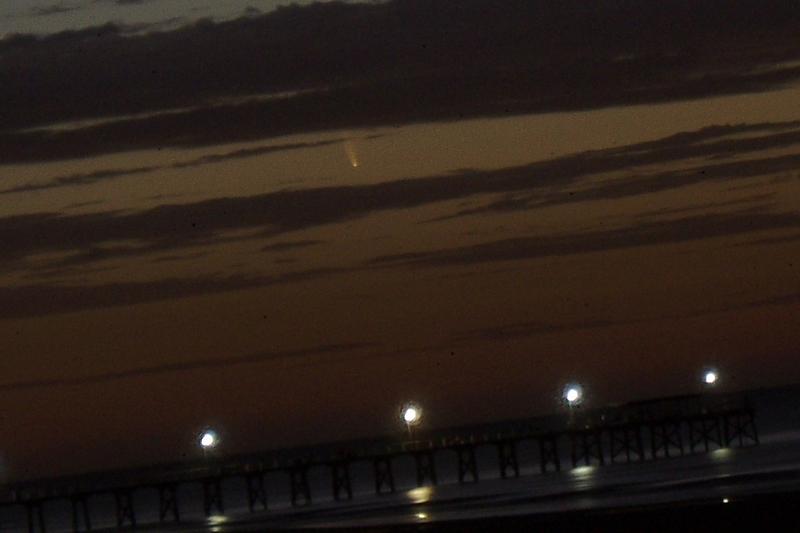 Then I got the camera, and rushed up to the beach...just in time to see the comet vanish behind the cloud. Myself and some other comet afficionadoes hung around for a while, and were rewarded with the comet breaking through the clouds (see picture above). I've made an animation of the comet pasing through the cloud bands (4 Mb file). Then the comet vanished in the murk abnd the footpath cometographers stood around a while saying how fantastic it was before heading home. The forcast for the next few days is rain, I'd be dissapointed except I know how much the firefighters and folks threatened by fires need a break, lets hope they get some relief. Image credit Geoffrey Sims (click on the image to enlarge). I've been sent some fantastic images, weblinks and accounts from people who have seen the comet. When I get the time I'll put togeter a webpage to summarize P1 McNaughts visit from my correspondents. In the meantime, gaze on this image from Geoffry Sims (I have some moreof his as well). It takes your breath away. As well, see this fantastic series of shots of comet McNaught taken in the daytime by astrophotography supremo Shevill Mathers. While we are out looking at the comet tonight, spare a thought for those people in Threadbo and Victoria whose homes and livelyhoods are threatened by massive bushfires. The red haze on the horzion means peolple are out fighting fires, rather than getting rest or being with their loved ones. Send them your thoughts or donate to charity to help the victims of the fires please. Comet McNaught has left the C3 camera. Image Credit NASA/SOHO. James Place Cameras has shut down! I wandered up there to buy some ASA 400 film for the SLR camera, only to find it closed, dark and empty! This was the best place I found for getting my astronomical photos developed (and very convenient to drop in on on the way home from work). As I stood there befuddled, the Bettdeckererschnappender weisle rang. She had locked herself outside the house (on a 40 deg C day), could I come home early? As it happened, I had been kicked out of the lab by a fire evacuation. A false alarm due to the heat, but we couldn't go back in until the security panel was cleared, a good 15 minute exercise. Since it was 10 minutes to knock-off time I was on my way when she rang. So I unlocked the door, only to find she and a screaming horde of kids (some of them our own) had whiled away the time by swimming! It was a bit less of an emergency than I imagined. Then the other parents turned up, and then it was on to the Pub, Schnitzel Night! Yay! Of course, this is the time the change comes through, so on our walk on the beach, it hads cooled down from baking, but clouds cover the horizon. sighs expressively. Didn't pick up the comet in daylight either. Astronomical relevance of the photo (apart from showing the cloud that blocked out the comet). The medieval looking tower is the Time Ball Tower, which set local midday by dropping the ball on top of the pole (so that all the achored ships could see it and set their on board clocks accordingly). 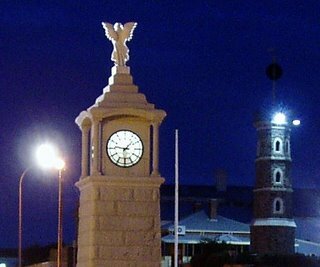 The time was transmitted to the tower by semaphore from the Port Adelaide Astronomical Observatory. Many people have written to me saying that the comet was clouded out last night. That is a shame, but there will be lots of opportunities to see it over the coming week. Tonight the comet will be dimmer, but it will also be higher, and so could possibly be more easily visible than last night. 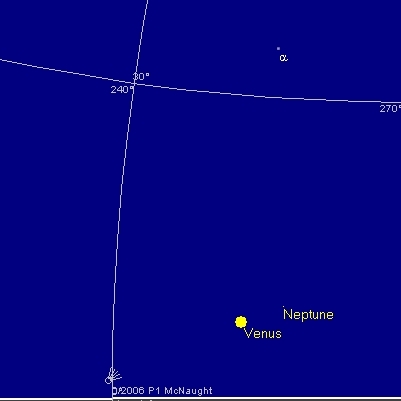 Again, start looking to the southwest, left of Venus, around 20-30 minutes after sunset. See this location map from Rob McNaughts site, its very good. Also check out Ice in Space. Click image to enlarge. Well, I saw Jupiter and the Crescent Moon ranged under the curl of the Scorpion. But Mars was hidden by trees. Darn. Well, it was beautuiful anyway, although I really wasn't awake enough to enjoy it. More comet today hopefully. I saw it! I saw it! And it was fantastic. The image to your left is my best attempt at a photo as we watched in the twilight (its the faint dot near the top righthand corner of the image, click to enlarge). Instead of searching for the comet in daylight, I should have been buying film for the SLR camera. But it was worth hunting around in the sky for McNaught during daytime. It was a bit serendipitous, I was actually looking in the wrong spot, and had my eye drawn to the comet by a passing bit of fluff. And there it was! I was lucky, the comet was next to a cornice, which blocked out the Sun and pointed directly at the comet. I was able to see it reasonably clearly, as a faintish dot with a short tail, when I had my eye in. I was able to relocate it, then rushed upstairs, dragged the Iron Chef downstairs and showed it to him, and he was able to see it clearly (ahhh, to have young eyes again). But to see a comet in daylight (1:24 pm), was amazing, no matter how dim. 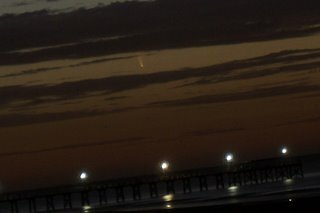 So when I got home we had visitors, after the obligatory swim and communal dinner, I chivvied them off to our local Adelaide beach to look for the comet. I had zero resistance, as they had heard of the comet and wanted to see it. We got there about 15 minutes after sunset. 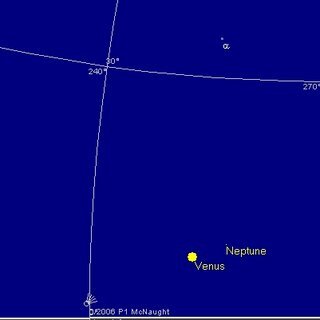 I pointed out Venus, then started describing how to look for the comet when it got a bit darker, as I was finishing my description, there were excited cries of "I see it! I see it!" Confused, it turned to the sky, and there it was, absolutely clear. "Bloody Hell!" I said. It was fantastic. There was a fair bit of haze, ironically, after the very clear night last night, but the comet and a short tail (maybe a fingerwidth long) was very visible. It's hard to say how bright it was, I think it was about Venus brightness, but because it was deep in the haze, and low to the horizon, it looked dimmer than Venus off to the right. It beats the heck out of Halley, but sadly, the photo does not do it justice, as I couldn't control the exposure. We watched it excitedly, passing the binoculars around, various friends and neighbours, and the odd stranger, wandered up, and asked what we were doing. So we pointed out the comet and gave them the binoculars as well. There were various exclamations of delight. A bloke who was actually after the comet came up as well, and we pointed it out. A footpath astronomy festival. There was a festive air at the scene, the deep colours of the sky, the bright slash of the comet coloured orange by the haze, Venus gleaming above, the warm air blowing of the sea with a tang of salt. A magical night. It will be great to follow the comet over the next few nights. It will be dimmer, but it will be higher in the sky, and easier to see. I better get some film for the SLR though, so I can do longer exposures. 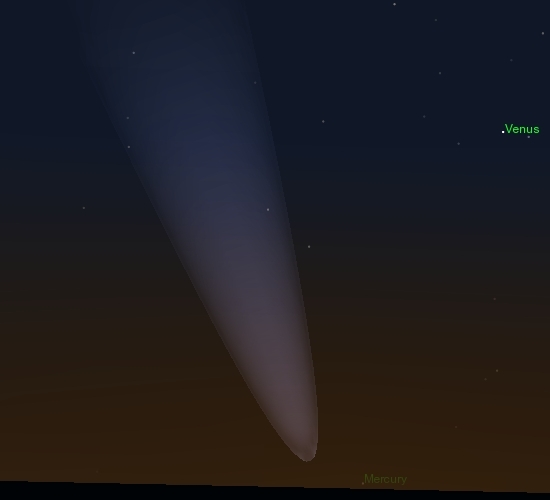 I'll try again to see McNaught in the daylight, I've marked my viewing spot, so I can go back to it. Now I hope I'm able to get up early Tuesday morning to see Mars amongst the Nebula. Comet 2006/P1 McNaught Visible in Daylight. 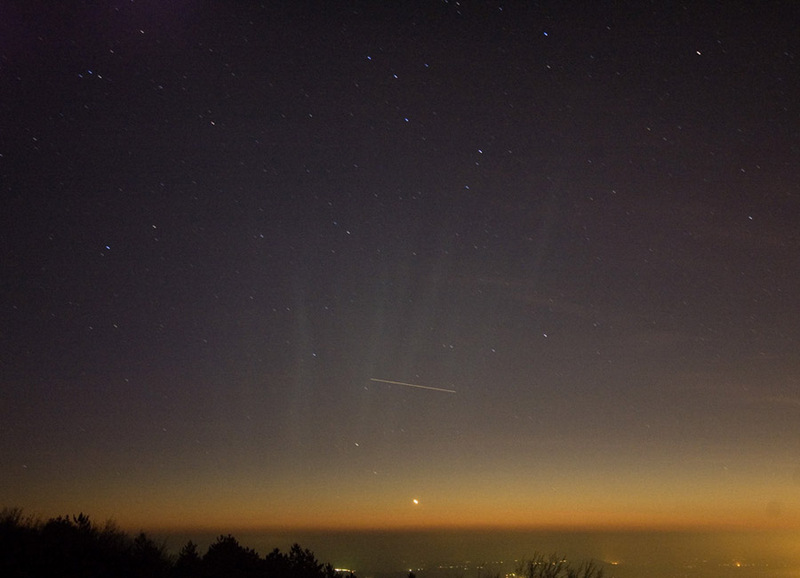 Comet McNaught has been reported to be visible in daylight with the unaided eye. See Spaceweather for an amazing image of this comet in daylight. Magnitudes have been reported from -3 (less bright that Venus) t0 -4 and -5 (much brighter than Venus). This bodes well for Australians (and Southern hemisphereians generally) seeing this comet from Monday 15th Jan on. 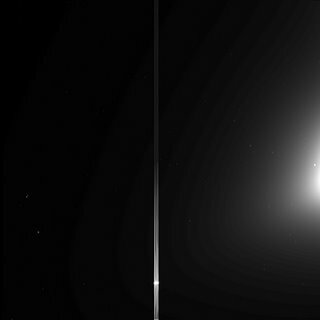 This animation (image credit, SOHO/NASA) shows McNaught entering the field of view of the SOHO LASCO C3 camera, Mercury is the bright obect at the bottom, and comet McNaught is, well, pretty obvious. 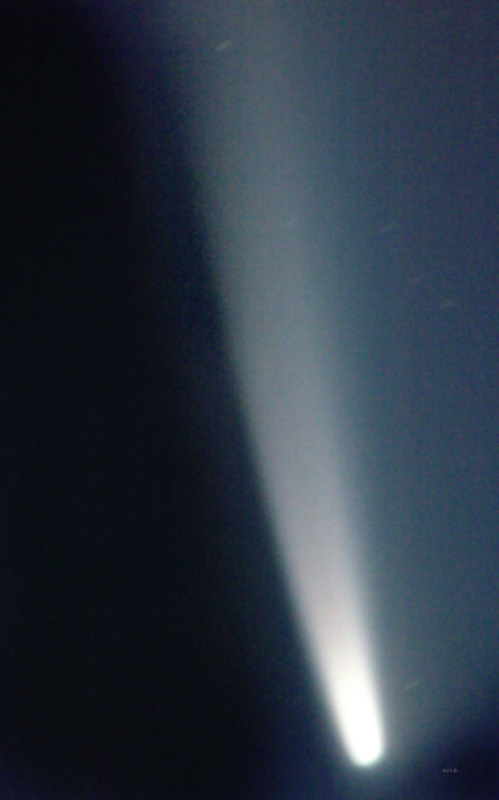 The vertical strips are artefacts of light saturating the instrument. The bottom line is that the comet is bright. This is reenforced by the appearance of the comet in the STEREO a cameras, the image is greatly saturated, the comet head doesn't look like a comet head at all (more like a hammer head). Again, Mercury shows up as a spike at the bottom of the image. A better image from the STEREO b cameras is here. For some stunning images taken from Earth, see this brilliant image from Italy, taken as the sun was setting. The Spaceweather gallery has many images of the comet. The Bad Astromomer has a cool video, though he looks a bit daggy. Here is another good image from Italy, some great shots from Germany, sunset shots from San Deigo, (and here as well), another terrific shot from the USA, and one from Germany. Good luck looking for the comet, the brightest in 30 years! While we are waiting breathlessly for comet 2006/P1 McNaught, Mars is slowly gliding towards the Lagoon Nebula in the morning sky. Over the mext few mornings, watching Mars approach the Lagoon Nebula will be beautiful, cumulating on the 16th, when Mars is in the heart of the Nebula. Best viewed with binoculars. 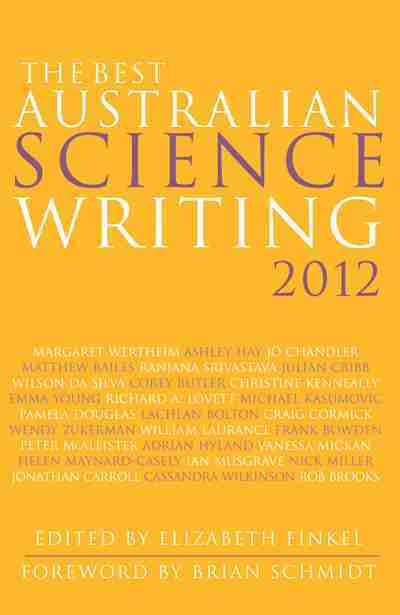 Guess what, my Pandas Thumb essay on the quirky design of the vertebrate retina is going to be published in print, in the Science Blogging Anthology. Cool! Stuart reminds us that the Blog Awards are here again, I agree with his suggestions for nomination (grin), so why not pop over and vote for Phil, Tom, and dare I say it, Stuart as best UK weblog. A whole lot of images here. From Martin Mc Kenna (Ireland), Kadachev (Bulgaria), Toni Scarmato (Italy, includes animation link near the bottom, great animation), Mike Holloway, Dan, Alex Conu (Romania), and Chris Cook. Negative magnitudes are being reorted for the comet now. Lets cross our fingers for a good show. Pop over to Vidar Martinsen's site, click on Nyheter(News) and Komet McNaught, then download the animation (warning, 8.8 Meg windows media player file). Comet P1 McNaught is Bright! 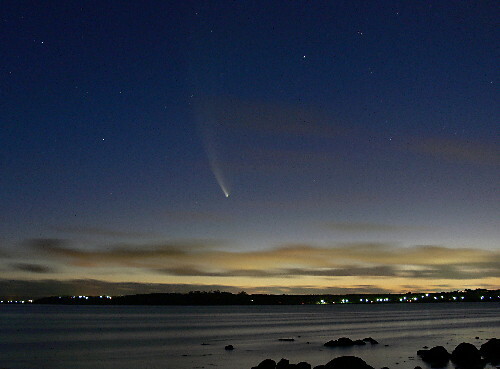 No, comet McNaught will not look like this. Provided it survives its passage around the Sun, it will be much dimmer than Venus, probably more like Mercury or even dimmer. I can't get Celestia to do a more realistic magnitude rendering (see below for actual images). But the point is that this image does give you a feel for where the comet will be, above the western horizon, half an hour after sunset on January 15th. This is the most reasonable time to start looking for the comet (or perhaps even 20 minutes after sunset). On the 15th, the comet is just a fingerwidth above the horizon half an hour after sunset, and so will be very difficult to see. Try scanning the horizon with binoculars then or 10 minutes earlier (some northern hemispherians have picked up the comet 20 mins after sunset this way). 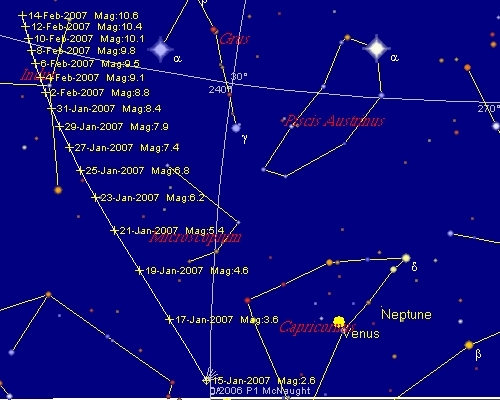 As the chart shows (the chart is facing southwest, with due west being the rightmost edge of the image, click to enlarge) The comet rapidly rises in the sky after the 15th, but also rapidly dims. 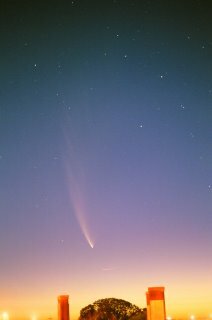 On the 17th, the comet sets after nautical twilight (an hour after Sunset), so it should be readily visible in binoculars, and may also be spotted with the unaided eye. Thereafter, it should be visible as a fuzzy dot with the unaided eye. A printable chart suitable for most of the southern hemisphere is here. 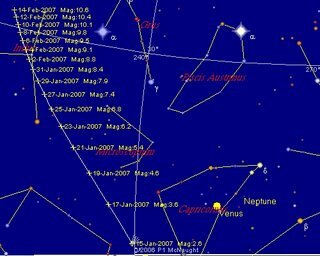 If you have a planetarium program, an ephemeris is here, which you can download into several program formats. Also, you can play with the JPL orbit simulator. 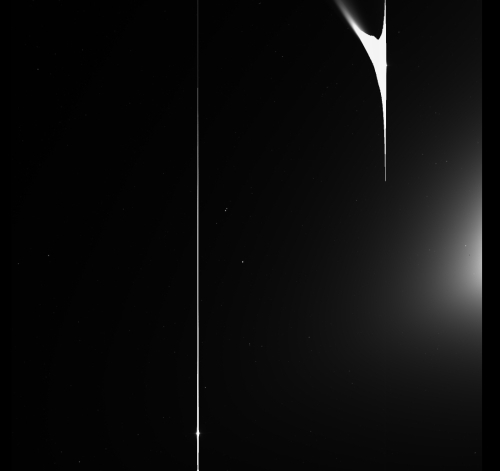 A Celestial ssc file for 2006 P1 McNaught is here. Having said that the comet may need binoculars to see most of the time, it may turn out to be spectacular. Australia's own Terry Lovejoy captured the comet in daylight (using a telescope of course). And northern hemisphere observers have produced some spectacular shots. Michael Jager, Gerald Rhemann and Stefan Beck have produced some excellent images, such as this one and this one. There are some great images from an Italian group, Hakon Dahle in Norway generated these fantastic shots, Dr. Eric Flescher from the US has a couple of nice images on his weblog too. If you can't wait for the 15th, the comet will come in to the field of view of the STEREO cameras on the 10th (but the images won't be available until the 11th, and are in FITS format, so you need a FITS viewer, the Gimp can handle it) , between the 12th and the 15th the comet will be in view of SOHO's LASCO C3 camera. For southern hemispherians, the Ice in Space forums will be abuz, there is a forum for maps charts and viewing guides, and images of the comet. Do drop in to see what's happening. Today turns out to be a very busy day astronomically. There is the Transit of Iapetus visible from Australia, and today is also when Mercury is at Superior Conjunction, that is, when Mercury, the Sun and Earth are in a line, with the Sun between Mercury and Earth. Of course, we can't see it ourselves, the Sun being too bright. But this SOHO image shows Mercury as the very bright dot just under the dark occulation disk (the horizontal line is an artefact of the imaging system). Last November, when Mercury Transited the Sun, it was at inferior conjucntion (ie between the Sun and ourselves). Mercury didn't turn up on the SOHO images until quite long after transit, as in inferior conjunction the mostly dark side of Mercury faces us, while in superior conjunction the bright side faces us. Just before conjunction, there were a series of CME's from the Sun that went past Mercury, you can see them and a movie of them at SOHO's Pick of the Week. You can also pick up Mercury in the STEREO images. STEREO data isn't released in near real time, so there is some delay in getting images. This is a stack of 3 images from 2 Jan, showing Mercury's movement. The STEREO images are FTS images, so you need something like The Gimp to open and view them. Iapetus peeks through the Cassini division at 1:00 am AEDST on 8 January in Melbourne (around 12:30 am in Adelaide and central states). Eastern and Central Australia will be priveliged to see a rare transit of Iapetus across the rings of Saturn. Transits of Iapetus only occur every 7 years, with only four or five events during these favorable times. The down side is that Iapetus will be very faint (magnitude 11) and the rings rather bright, and you will need a serious telescope to see Iapetus at all, even then you may only see it when it crosses the Cassini division due to the rings brightness. Still, if you don't look you will never know. Saturn rises at around 10:30 pm daylight saving time on Sunday 7 January in all Australian states. 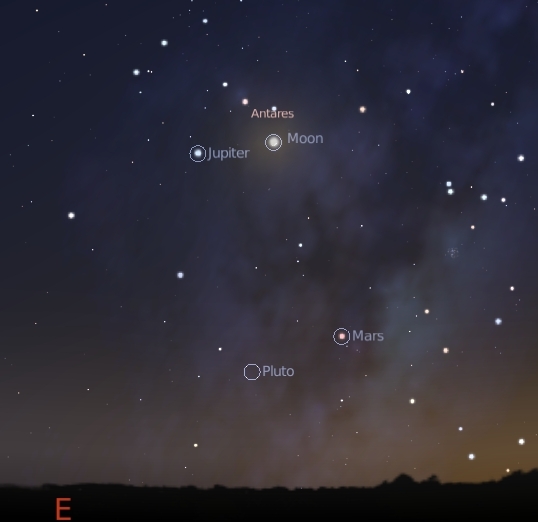 In Eastern states, Iapetus will enter the B ring at approximately 10:45 pm on Sunday, however, as Saturn is very close to the horizon, this will be impossible to see. 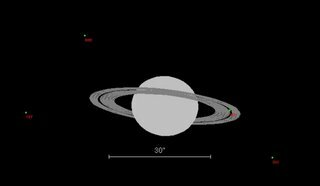 At around 1:00 am daylight saving time in the eastern states, Iapetus will pass through the Cassini divison, between the A and B rings, and by about 2:20 am it will exit the A ring. In Central states Iapetus is well into the B ring when Staurn rises, enters the Cassini division at around 12:30 am on the 8th and exits the A ring around 1:45 am on the 8th. In Western Australia Iapetus is in the Cassini division around 11:00 pm on the 7th, being just above the horizon this will be hard to see. Iapetus exits the A ring a little after midnight. Did you have a White Christmas? We did, Christmas day started off with a fairly heavy hail fall, so the ground was covered in white hard spheres, a sort of romantic (if cold) styrofoam. I didn't get a picture as I was too busy showing the boys to locate the camera, as well as being caught up with the general excitement of unwrapping Christmas presents. The hot an sunny weather we had been having disappeared over the Christmas-New Year period. On one hand, this made the traditional roast dinner with hot Christmas pudding bearable, on the other it kind of cramped our traditional swimming activities. It also cramped my astronomy related activities as well (I bought my portable telescope, so of course it was cloudy nearly the whole time). However, we did visit Scienceworks, so I'll write about that later. Towards the end of the Christmas period we stayed with friends of ours for an overnight visit. 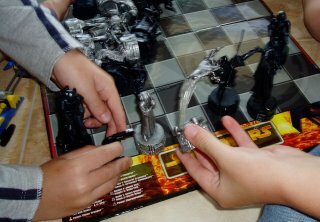 Their youngest, The Constructor, and Middleone got on famously, and there was much construction of bionicles (which took over most of the living room floor). 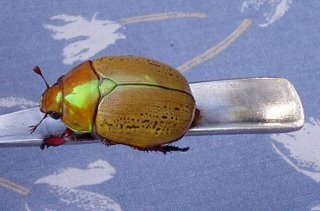 As we left, our friend yelled excitedly "Look, it's a Christmas Beetle! ", we all rushed over --- to see a cockroach. 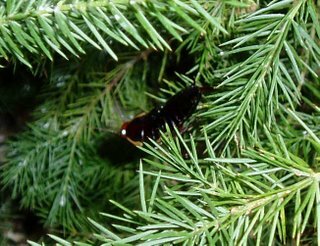 A native cockroach that helps break down leaf litter, not the imported ones that live in garbage, but a cockroach none the less. 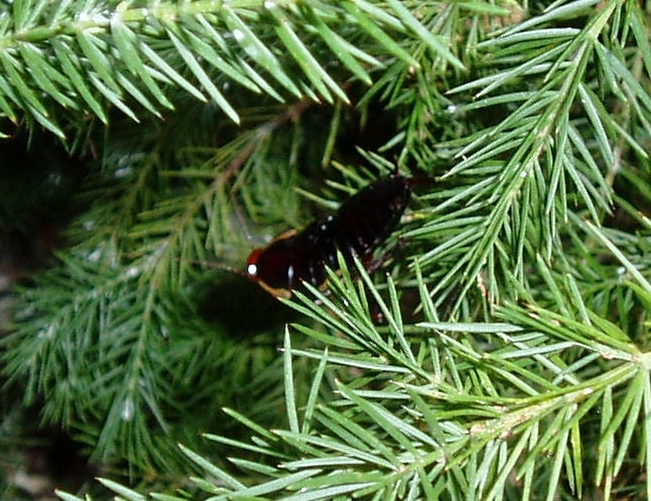 For a real Christmas beetle, see the image to the left, taken around Christmas last year. After much giggling and careful inspection of the cockroach, and lots of farewell hugs we waved goodbye and drove away. The Bettdeckererschnappender Weisle and the boys have gone to stay with the rellies down at the beach near Wilsons Promontory, while I'm getting ready to go back to work, and write a few articles on upcoming interesting things. I hope your Christmas - New Year break was happy and safe, and I wish you a great 2007, filled with grand astronomical treats.